"Grandmother's Personalized Moment in Time Bracelets, Double Intertwined Silver"
Honor the moments in your life that mean the most to you. This double bracelet is an intertwined work of art celebrating your life. There are dates you never want to forget…and now you won't. The birth of a grandchild, the day you got married, the day you retired ~ all of these are days which hold a special place in your heart. Commemorate the favorite moments in your life on this double intertwined bracelet. Personalize with grandkid's names and birthdates, nicknames and words or milestone events in your life...be creative and make it special to you. Each bangle will be stamped with a name/word and a date - or you can choose to have two names/words. 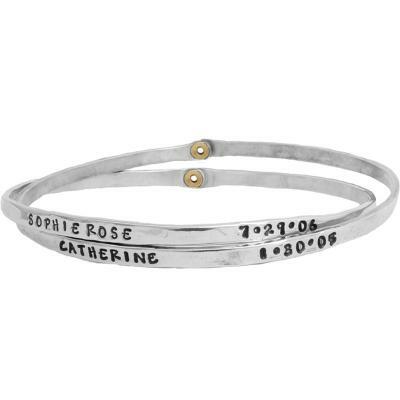 Stamp the grandkids' birthdays and names on each bangle or maybe their nickname and a word that describes them. The bracelet is stamped two times with a maximum of 12 characters/spaces. The stamps will be separated with about an inch to an inch and a half of space. Because these bracelets are customized, all sales are final. Bangles are approx 3mm wide. All silver is sterling and rivets are brass. This is a bangle bracelet and does not have a clasp, it slides over your hand and onto your wrist.